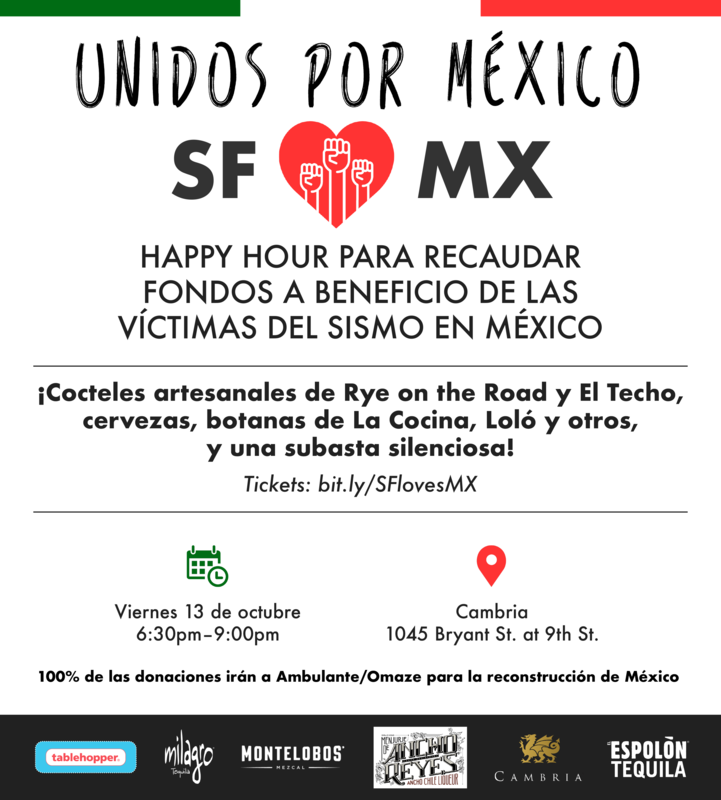 This Friday 10/13, Don't Miss SF ❤️ MX, a Happy Hour Fundraiser for Mexico! 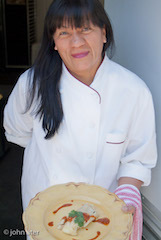 Alicia Villanueva of Alicia’s Tamales Los Mayas. Photo: John Ater. Happy hour will be special with Espolòn Tequila cocktails by Rye on the Road. Photo courtesy of MADE PR. 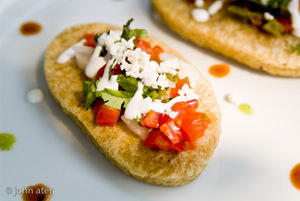 El Huarache Loco is going to be serving mini huarachitos con nopales. Photo: John Ater. 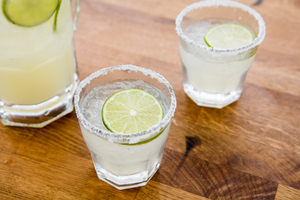 One of the five cocktails we’ll be serving are El Techo’s classic margaritas. Photo: Aubrie PIck. 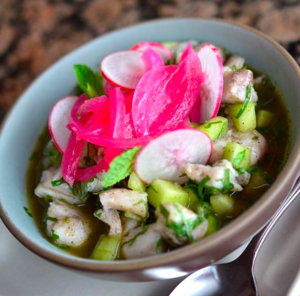 Chef Daniel Tellez of Copita will be at our event serving ceviche. Photo: Copita. 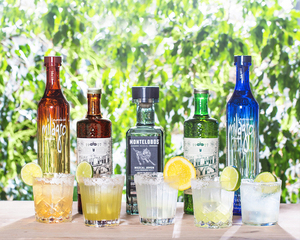 The Hechos in Mexico portfolio with Milagro Tequila, Montelobos Mezcal, and Ancho Reyes will be en la casa! 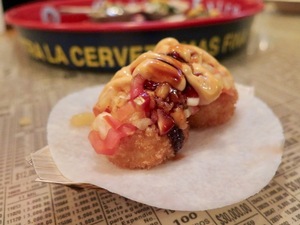 Loló is going to be serving a version of their incredible taco tropical! (The best.) Photo: © tablehopper.com. 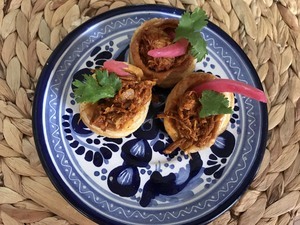 Cochinita pibil from La Cocina’s Sal de Vida Gourmet—we’ll be having tostaditos! Photo: Sal de Vida Gourmet. I know the recent quakes and horrific damage in Mexico seem far away considering all the terrible disasters our planet has suffered the past few weeks, but there are still many people and places in desperate need who will benefit from our assistance. There are so many people now homeless and living in shelters or sleeping outside, people who need food, volunteers who need help. Villagers left with nothing. Sadly, a lot like what is happening here in ravaged Northern California, but with less resources to get back on their feet. I hope you can support the happy hour-style fundraiser I am hosting with the wonderful folks at Cambria Gallery in SoMa. 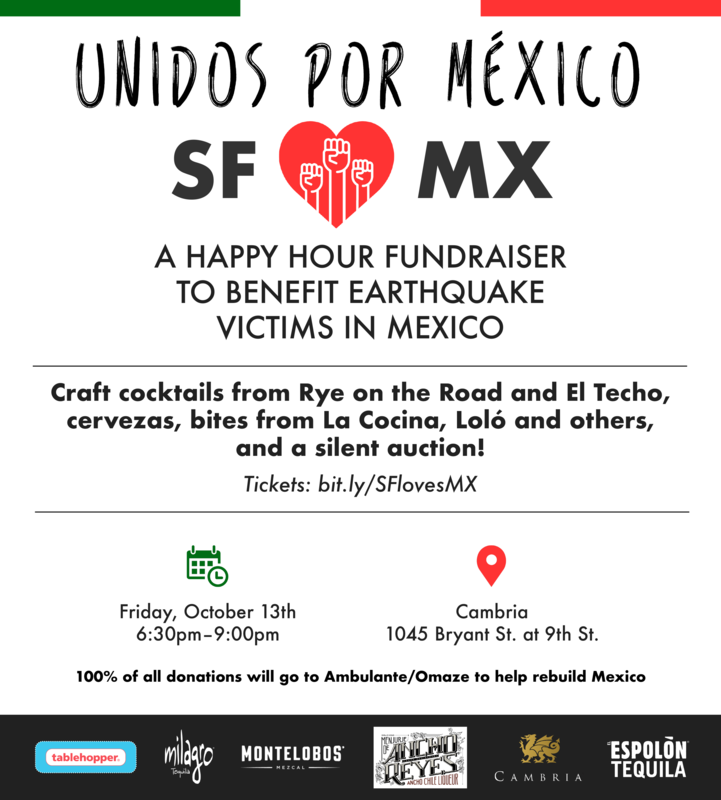 We’re calling the event SF ❤️ MX and will be serving a bunch of delicious dishes and craft cocktails this Friday October 13th for Mexico earthquake relief (100% of the proceeds will be donated!). Even if you can’t attend, can you please help spread the word? See below! Thank you so much. I have some exciting updates to the lineup, including the news that we have three La Cocina businesses joining us (gracias, damas! ), and chef Carlos Villapudua and his brother Mundo of Villa Montez and their new 1836 Texas Kitchen in Tyler, Texas, are flying to SF to cook at our event. Amazing! There will be abundant bites from Loló (taco tropical), Sal de Vida Gourmet (cochinita pibil mini tostadas with pickled onions), Alicia’s Tamales Los Mayas (vegetable and meat tamales), El Huarache Loco (mini tostaditas de tinga and mini huarachitos con nopales), Copita (ceviche), Don Pistos (tamales and albondigas), WesBurger ‘N’ More (queso), and others, including Green Chile Kitchen, who will be serving their grains & greens salad with chipotle vinaigrette (vegetarian). There are some other vegetarian options too (please look above). If you want to contribute anything sweet, please get in touch! Thank you to everyone who is so generously providing food for the event. 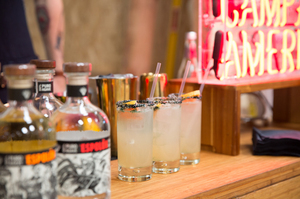 The bar will be shakin’ with fantastic cocktails courtesy of Rye on the Road and El Techo, featuring top spirits from Campari America/Espolòn Tequila, Milagro Tequila, Montelobos Mezcal, and Ancho Reyes. We have some awesome bartenders donating their time and expertise. Mexican cervezas will be generously provided by Cadillac Bar & Grill and Hard Frescos (they are a new brand, making cold-fermented aguas frescas!). Many thanks to Chambers & Chambers for donating cases of French rosé wine for you to enjoy! It will be #roséoclock. We also have a fantastic silent auction, with gift certificates and more (thanks to Nopa, Nopalito, Flores, Uno Dos Tacos y Tequila, 54 Mint, Montesacro); gift boxes from Campari America, Milagro Tequila, and Manicaretti; gift certificates from Ginger Rubio Salon; and an ice cream maker AND Le Creuset pan from Joanne Weir. Plus, we’ll have local art from Rob Delamater and Adam McCauley. La Cocina is offering a VIP experience for the 2017 San Francisco Street Food Festival, which includes an open bar, vouchers for five booths, and a personalized walking tour of the new event venue by executive director Caleb Zigas for up to four guests. This isn’t something even usually offered, so it’s really special. And Mark Pasternak of Devil’s Gulch Ranch is donating a tour of the ranch and dinner (or lunch) for four people, featuring meats and wines from the ranch, plus Marin County vegetables and cheeses. We need a few more volunteers to help serve food and keep the event tidy! And my camera is on the fritz (ugh! )—it would be amazing to have a photographer there, gracias. Please get in touch if you can help in any way! Special thanks to Dominic Philips Event Marketing for the generous donation of serveware and utensils for the event. This event will be a 100 percent donation to Omaze and Ambulante’s fundraiser, started by Diego Luna and Gael García Bernal to help Mexico rebuild. Click the link to read more about this thoughtful and legit fundraiser. Tickets are on a sliding scale ($35-$150+, ALL INCLUSIVE)—all we ask is that you please pay what you can afford to donate, gracias. Most importantly, we just want you there! Even if you can’t attend, if you can please help spread the word, we’d so appreciate it. Here is the event on Facebook, Twitter, and Instagram. Thanks for liking and sharing! See you this Friday October 13th! 6:30pm-9pm. 21 and over. Cambria showroom, 1045 Bryant St. between 8th and 9th streets.